Corsair Twin2X2048-6400 C3 PCSTATS Review - Max OC Chart and Conclusions! Abstract: According to Corsair, the Twin2X2048-6400C3 memory is rated to run at DDR2-800 speeds with CAS latency timings of 3-4-3-9, albeit with a voltage of 2.2V. Max OC Chart and Conclusions! It's great to see how individual memory stacks up against the competition under stock configurations, but we're also going to show how it compares when overclocked. With performance in mind, we're going to compare the maximum overclocked results of the various DDR2 DIMMs we've tested in the past which are listed below. Remember, just because memory is clocked fast doesn't mean it's the best thing for a computer. Timings are also important, and getting the right ratio of both is the real key to performance based overclocking! The Corsair Twin2X2048-6400C3 is some fast memory, with 3-4-3-9 timings it is clock for clock the fastest DDR2 memory available on the market. With tight timings the memory overclocks moderately well, and loosening things up allows the memory to crack the 1 GHz barrier. Memory manufacturers have dramatically improved the DDR2 landscape the last few months and are finally starting to release lower latency DDR2 memory modules. While memory timings of 4-4-4 are much better than what JEDEC calls for at DDR2-800 speeds, things still could be tighter. Enhanced Performance Profiles (aka EPP) promises to increase system performance now that memory timings and frequency can be adjusted dynamically to meet the system's demands. This is an open standard that works at the hardware level and it's up to each memory manufacturer to tune its own memory. EPP supports two full, or four half performance profiles, these which automatically adjust the memory modules to best fit the type of load the system is facing. For the experienced overclocker, Enhanced Performance Profiles will not offer much improvement. On the other hand, EPP is a great guide for novice enthusiasts who are just getting into the overclocking game. Just like dynamic system overclocking via the motherboard, EPP promises to bring memory tweaking there as well. 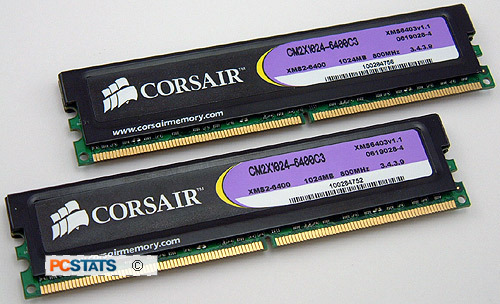 Corsair's Twin2X2048-6400C3 memory is the first DDR2-800 class memory that can run with a CAS Latency of 3. Finally there is some true low latency memory on the market, and as everyone knows, the AMD Athlon64 loves memory that uses tight timings. From the benchmarks, you can see that the tighter timings give the system slightly better performance than the memory that's rated at 4-4-4-12. From 3DMark05, Doom 3 and Business Winstone 2004, everything was just faster on the Corsair Twin2X2048-6400C3. To get to those timings, Corsair had to increase the default voltage from 1.8V to 2.2V, which is quite a jump but definitely well worth it. With the tight 3-4-3-9 timings the Corsair Twin2X2048-6400C3 did not overclock very high hitting a maximum speed of 218 MHz or DDR2-872. Loosening up the timings to JEDEC DDR2-800 standard of 5-5-5-15 allowed the memory run as fast as 264 MHz while maintaining 100% stability. The only downside to the Corsair Twin2X2048-6400C3 is its huge price tag. At $505 CDN ($454 US, £243 GBP) , this memory runs for almost double what standard DDR2-800 memory modules cost. Then again, computer hardware enthusiasts know that overclocking is an expensive game and at the moment Corsair's Twin2X2048-6400C3 is the fastest ride available. Pg 5. — Max OC Chart and Conclusions!